I’ve said before there’s no need to show you shots taken with the camera here. For SLR bodies which work that is more reliant on the attached glass and the skill of the photographer than the body. 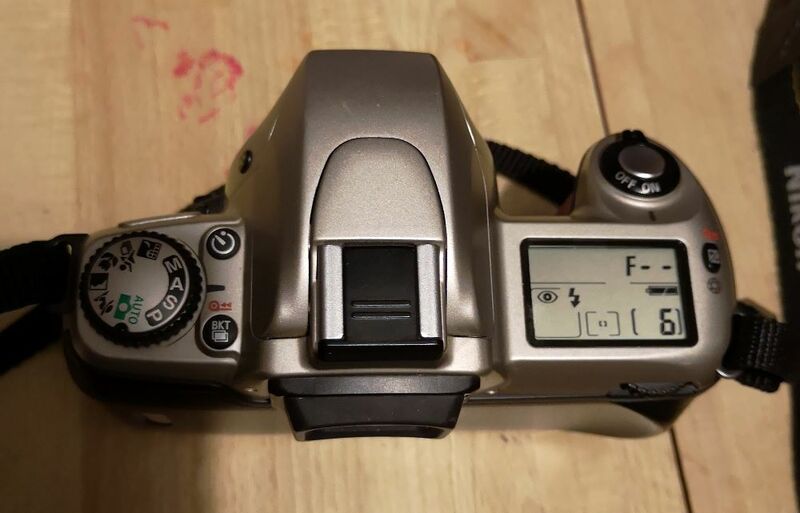 Known as the N65 in the USA and the Nikon U in Japan this is a 21st century consumer AF SLR body. Launched in 2001 as the successor to the F60. It’s often described as a entry level camera although as we’ll see it arguably sits nearer the mid range class. It was successful enough to still be on sale in 2006 when Nikon pulled it’s entire range of film SLR bar the F6 & FM10. That’s important to note as it was effectively straddled by 2 models the definitely weaker F55 and the more mid range F75. The F75 has become known as the poor man’s F80 (aka the poor man’s F100) sharing the same AF module. Nikon F75 with 50mm 1:1.8 AF-D Nikkor . Just a few quid more for so much more. So the easiest thing to do is to compare the F65 & F75. Both offer single and continuous server AF modes for locking on a stationary or moving target. The cameras differentiate in the ease you can switch between focusing modes. The F65 offers 5 point dynamic closest subject focusing (default) or the option to use one of 5 single point dynamic focusing. To switch you need to hold the AF button on left hand side (as held) and turn the command dial to select. The F65 is easier. On the film door there’s a 3 point switch allowing you to move between these mode and an additional center weighted focus mode and a 4 point pad allowing you to select 5 dynamic focus points. Both cameras have a 3D multi segment metering system . Nikon might lag behind others for AF but their metering systems were killer and these benefit from being late generation ones. Matrix metering essentially allows the camera to measure light in a set of segments to help work out the correct exposure across the scene. Nikon matrix metering goes a step further by comparing those values to 1000’s of sample scenes adding to accuracy. Don’t get hung up on the fact that the F75 has a 25 segment meter versus the 10 of the F65. The F4 only had 5 and wasn’t seen as a slouch. Worth noting the F75 came in a choice of black or predominate silver. The F65 is by default a silver/black combo unless you buy the data back (QD) version which is black. 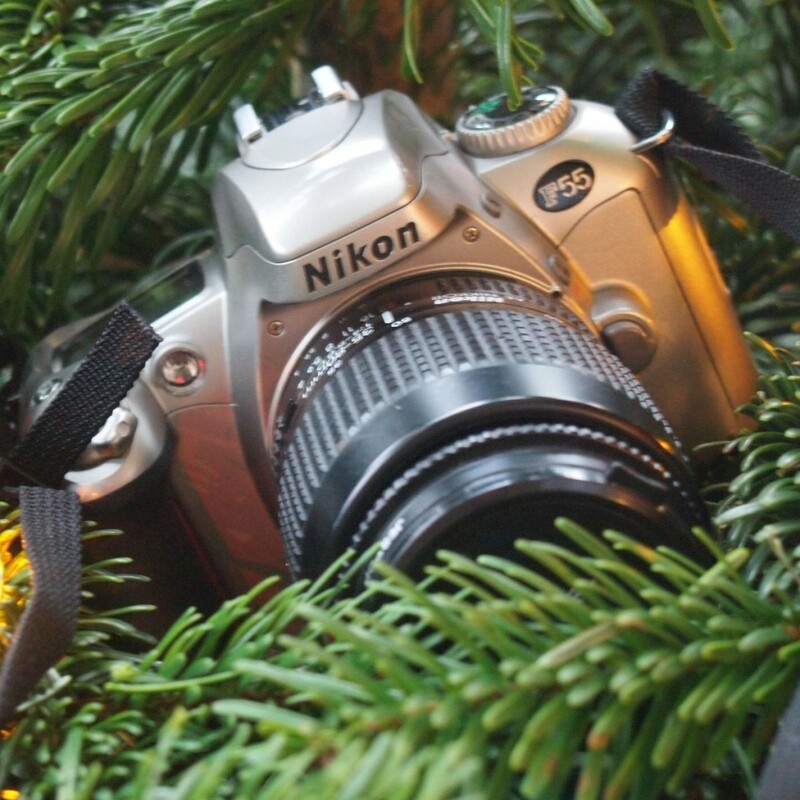 My Nikon D50 was launched in 2005 and was Nikon’s first entry level cropped sensor dSLR. Mines (touchwood) has done almost 24000 actuations in the 14 years I’ve owned it and I’ve seen an estimate that is just under half it’s average life expectancy. I’m guessing these 2 film boys would be about the same. Assuming these cameras were both first used in 2005 and shot the same number of images – we’re talking almost 48x36exp rolls per annum. This is really an issue for the future but not now. If you shoot in auto or in any of the modes without using other features these are both similar in the hand both by weight and grip. The viewfinders are roughly the same and give similar info. The F65 has a bigger LCD panel and mines seems slightly quieter with shutter and winder. Many of the other feature buttons are reasonably located on both. But it becomes clear that the F75 is just laid out better if you shoot off basics. The camera is also more logically set up. A good point is the DoF preview buttons. Basically these are identical. Both will be more than happy mounting and using all the features of the usual AF-D , AF-S or AF-I lenses. They can use AF-P lens but without AF. They support G class lenses even the DX digital ones for cropped frame dSLR. For manual focus lenses they can mount AI revision onward lenses but there’s no metering. these can be used in manual mode and focus assist will work. The F55 is a crippled version of the F65 with less lens support (no AF for AF-S and won’t work at all with DX class. It also has poorer AF 3 point module and a simpler matrix metering. As a second camera provided you mainly user older AF-D class lenses it does the job however. It also comes in that bit cheap although we’re quibbling over a few quid here. 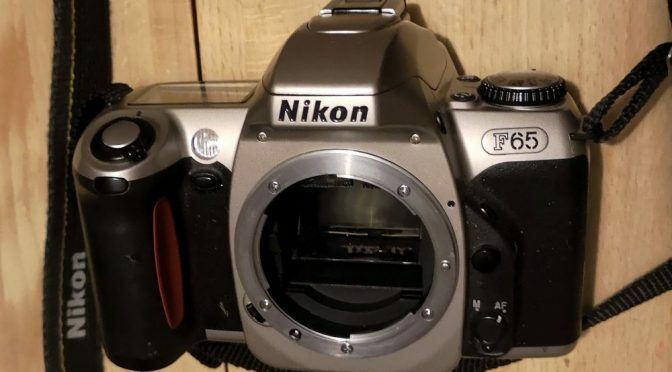 I wouldn’t by it as my only AF Nikon however. 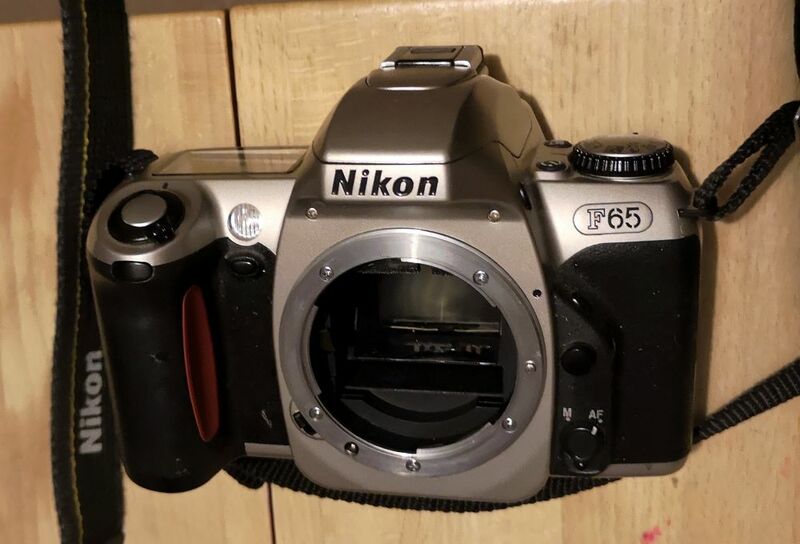 Most Nikon F65 sell around the £5-15 mark on eBay before postage. the F75 is usually nearer £20 but is possible to get a steal for both. I’d always suggest looking for a camera with a lens as you’ll likely pay less than the 2 parts combined (and if you don’t need the lens you can usually sell on more than covering the spend). On one hand this is an incredible camera for the money. Brilliant matrix metering and for a Nikon not a bad focusing system. It will allow you to mount most Nikon lenses from the mid 1970’s onwards and supports high end features like VR reduction. 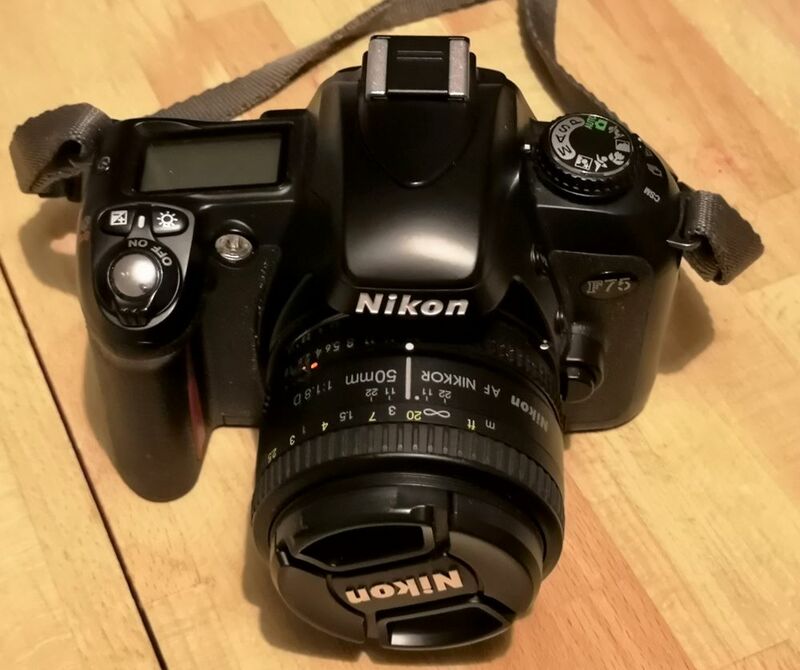 If you’re wanting to shoot Nikon AF lenses this is not a bad camera for most users. It really is the prototype for the F75, which takes all it’s pluses and irons out many a problem. And it really is worth the extra spend of just a few quid for the features it brings to the yard. Neither are that robust. But given the fact you’d need to shooting 2 rolls a week on these babies from original purchase to come near average shutter failure. There’s life in these dogs yet. More pro photographers may need the higher end features of a F80, F100 or F5 or 6 but even then this would be a reasonable second body. Unless you also owned a F75. And weirdly the much older Pentax MZ-5 felt a much better laid out body despite the droppy flash and dark finder. It’s lens support is also better with decent metering available for MF lenses and an pretty good focus assist.